Nvidia has just announced a new GPU architecture called Maxwell and their first GPU to use it – GeForce GTX 750 Ti. We’ve had a card for testing and decided to give it a try and see how it will perform for Scrypt mining as normally Nvidia GPUs are not providing as much hashrate as AMD graphics cards for crypto mining. The next Maxwell architecture from Nvidia however is interesting, because it is focused on optimization for better performance per watt – something that crypto coin miners are also interested a lot in. The new GeForce GTX 750 Ti GPUs have a power consumption of just about 60W and the price range for these cards is $150 USD. When you add the fact that a GeForce GTX 750 Ti based on the Maxwell architecture without overclock makes about 265 KH/s using CUDAminer these become an interesting solution for crypto miners. What driver version did you use? There’s a new one (334.89) out today for Maxwell. Also thanks for the results, good info! The driver version we used was 334.69, though we just also tried with the new 334.89 whql and the results are pretty much the same in terms of performance. Did you try the card with power pci-e 16x risers? Ones with molex / sata connectors? No, we do not have an extender with additional power connector. The x16 PCI-E extender was without additional power connector and the card had issues working with it properly. Using x1 extenders without external power is not recommended at all as they limited to 25W of power as opposed to x16 that supports up to 75W. 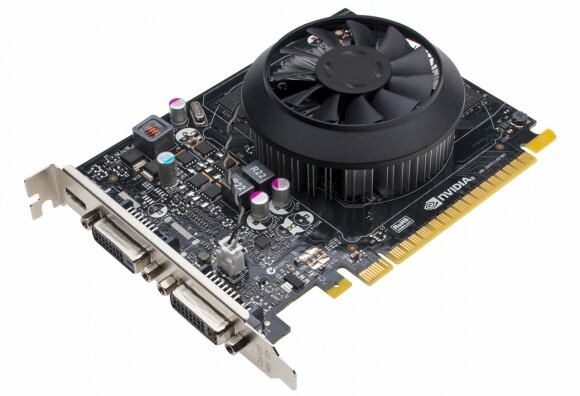 Can I use MSI Nvidia GeForce GTX 750 Ti Classic Video Card – 2GBDR5 OC, 5400MHz? and what about multiple cards? We haven’t tested the MSI model, but we see no reason why it will not work and perform similar to the reference model. what version of nvidia drivers did you use? The we have used both 334.69 and the newer 334.89 WHQL driver and no notable difference between them in terms of performance. I have the msi gtx 750 ti and I am having a trouble keeping it stable around 300ish… even at lower clocks I can’t get it stable and I am wondering if there is something silly I am missing. After like 30 min it gets unstable but temps fine and eveything in afterburner doesn’t look strange not too sure what is up. Using the same switches as you do in the bat file, they do seem to work the best. Did you have trouble installing cuda toolkit 5.5? Was wondering if it had something to do with that? I even raised pcie voltage in bios to max. Tried the 2 most recent versions of cudaminer. Great article btw thank you. soulrain, have you tried lowering a bit the video memory frequency? Our experience show that if the video card is unstable after some time of mining overclocked, going 5-10 MHz down on the video memory could make it stable for 24/7 mining. Also are you using a modified BIOS to increase the maximum power target limit to 65W, this can also help ad maybe even unlock some extra performance if your card is hitting the 100% power target all the time. We’ve seen a boost with up to about 320 KHS after flashing a modified video BIOS wit increased power limit on a card with the stock BIOS hitting around 300 KHS, so you might want to try that as well. Ya using modified bios even tested to see if the dual bios switch of the gfx card works which it does pretty neat (just takes a restart to take effect). Basically with any overclocking after an hour I get cuda scrolling errors I have no idea why. Tried varius nvidia drivers, went from win_7 to win_8 (couldn’t get xp installed). I have no idea over the course of three days have basically exhausted every conceivable combination of afterburner settings possible to fix this. Ya the link you posted is exactly what I used to alter and flash my bios. I confirmed it stuck with nvflash -b blah.rom then read with kepler to make sure was what I wanted. I did have trouble installing Cuda toolkit as the Hardware ID was not in the display.inf of Cuda toolkit 5.5 so I had to add it. I am kinda new to mining but not to comps so not sure if this is crucial. Thanks for the reply and once again great article and if you can think of anything else let me know! the more that I think about this… it sounds temperature related as what really changes over time. Added more case fans and see what that will do. Have some copper after market gpu coolers coming so will see how that works as well. Not sure if you have taken off the fan connectors on these cards but boy is it hard not to rip off the female connector! 80 degrees C is quite high for these cards, are they placer too close to each other – you are not using extenders? By default Nvidia sets temperature target of 80 degrees Celsius, so if the cards get to that temperature they might get throttled (operating frequencies lowered) and that can be the cause of thee instability you are getting. You can increase the temperature target, however the better solution is to get the cards cooler… this temperature is really high for the 750 Ti. Right now I just have 1 card in I am experimenting with it solo thus no risers or other cards at the moment. Ya 80C was while running MSI Kombuster under full load not sure if that is still unacceptable or not. I ordered aftermarket cooling anyway so see what that does. The weird thing is this: Why would I run stable under Kombuster for like 1hr than switch over to cudaminer and crash after a few minutes? This doesn’t seem right and I have a spacious case and lots of fans. Thanks for your insight and guidance. So I swapped the gtx 750 ti into another one of my boxes and it is working flawlessly. I am not sure if this is a conflict or something but the card just seemed unstable. Can you think of anything I should check or perhaps the mobo/psu/ or God knows what just didn’t want to play well together. Once again thanks for all the keen insight. Another update so 3 eva gtx 750 ti’s came today and the extra power connector in addition to the pcie seems to do wonders. The msi ones without additional connector I could not even get stable in another box no idea why. Most likely will just run them stock but guess time will tell. I’d invest money to create a rig like this but not sure about results in mining?! Have you made some tests and comparison? What board is the best for this GPUs? i have buy pci x1 to x16 riser for 750ti cards wich have and 6pins power connector , i must buy a riser with extra power conector or not ? i true that riser drop the hashrate ? i can do something about this ? Great article sir! I just bought a Geforce GTX 750 TI, and popped it into an old Dell computer I had lying around. It worked flawlessly out of the box on install and I was getting around 250k hash. This was on a fresh install of Win 7 Pro x86. I installed the Afterburner program becasues I wanted to monitor my CPU temperature, and I didn’t change anything, but now I’m lucky to get 30k hash. I’ve tried the coniguration script you have: -i 0 -l T5x24 -C 1, but it didn’t change anything. alex, if the cards have the extra 6-pin PCI-E power connector there should be no need for powered risers, if the cards have no PCI-E power connector on them you will need to use powered risers. 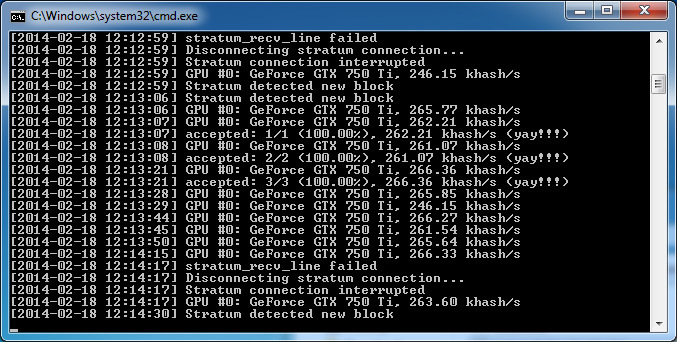 Robert Adger-Barton, if the cudaminer gives you an error and crashes you might need to restart the system in order to get proper hashrate again. You can also try to run cudaminer with autotune instead of passing it the T5x24 kernel to see what results you will get. Which version of CUDA SDK are you using? David K, the version we are using is 5.5. How do you run cudaminer with autotune? Robert, if you don’t specify a kernel in the command line the autotune feature is automatically activated. Hi I have just bought two geforce gtx 750ti cards to mine with and I am only seeing a hash rate of around 180 kh/s mining litecoins. I have them on an older motherboard and I was wondering if this would slow them down as I was expecting around 250 kh/s? Oracle1, it is a bit low, but there is no longer any point in mining litecoins with that video card, you should go for something like X11 or X13 mining for example with the latest ccMiner.